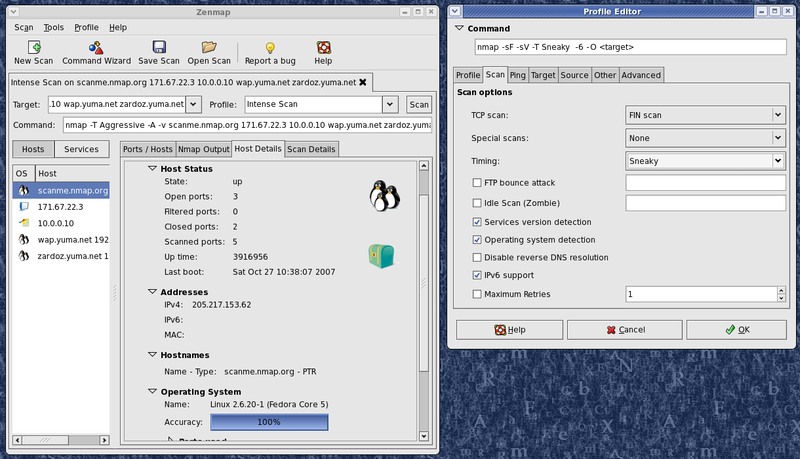 Nmap and Zenmap (the graphical front end) are available in several versions and formats. Recent source releases and binary packages are described below. Older version (and sometimes newer test releases) are available from the dist directory (and really old ones are in dist-old). For the more security-paranoid (smart) users, GPG detached signatures and SHA-1 hashes for each release are available in the sigs directory (verification instructions). Before downloading, be sure to read the relevant sections for your platform from the Nmap Install Guide. The most important changes (features, bugfixes, etc) in each Nmap version are described in the Changelog. Using Nmap is covered in the Reference Guide, and don't forget to read the other available documentation, particularly the new book Nmap Network Scanning! You can also get updates from our Facebook and Twitter pages. 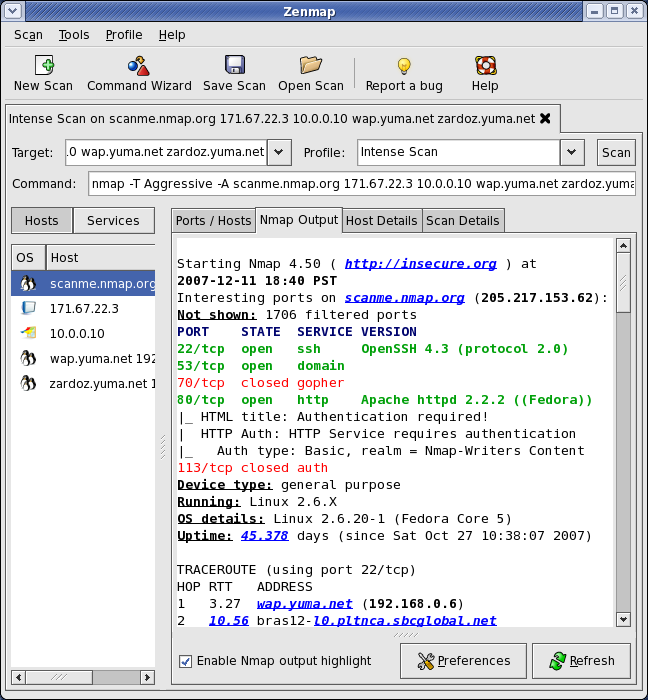 Nmap is distributed with source code under custom license terms similar to (and derived from) the GNU General Public License, as noted in the copyright page. Please read the Windows section of the Install Guide for limitations and installation instructions for the Windows version of Nmap. You can choose from a self-installer (includes dependencies and also the Zenmap GUI) or the much smaller command-line zip file version. We support Nmap on Windows 7 and newer, as well as Windows Server 2008 and newer. We also maintain a guide for users who must run Nmap on earlier Windows releases.. Note: The version of Npcap included in our installers may not always be the latest version. If you experience problems or just want the latest and greatest version, download and install the latest Npcap release. We have written post-install usage instructions. Please notify us if you encounter any problems or have suggestions for the installer. Nmap binaries for Mac OS X (Intel x86) are distributed as a disk image file containing an installer. The installer allows installing Nmap, Zenmap, Ncat, and Ndiff. The programs have been tested on Intel computers running Mac OS X 10.8 and later. See the Mac OS X Nmap install page for more details. Users of PowerPC (PPC) Mac machines, which Apple ceased selling in 2006, should see this page instead for support information. This is the traditional compile-it-yourself format. The Nmap tarball compiles under Linux, Mac OS X, Windows, and many UNIX platforms (Solaris, Free/Net/OpenBSD, etc.) It includes Zenmap, the GUI frontend. Most Windows users install with our Windows executable installer, but we also provide Windows source code compilation instructions. Most Mac OS X users install with our Mac installer, but we also provide Mac OS X source code compilation instructions. If you are compiling Nmap anyway, you might prefer to get the very latest code from our SVN source code repository rather than downloading a tarball here.